Blueberries, sugar, lemon. Delightfully, passionately blue. Wash blueberries and mix them with sugar and juice of two lemons. Cover with plastic wrap and refrigerate overnight. The next day, place them in a large pot along with the green apples' peel. Cook at low-medium heat, stirring occasionally and skimming if necessary, until jam reaches the desired consistency (about 45-60 minutes). Discard apple peel, and while jam is still hot, pour it in previously sterilized glass jars, close tightly and place them in a pot full of water, boiling for about 20 minutes. Turn off the heat and let the jars cool down in the same water to create the vacuum. Mmm, it looks so delicious!! I love blueberry jam! the blueberry jam is excellent. one taste and i knew i no longer needed a girlfriend. now i am free, FREE!!!!! and any sweetness i need is in the fridge. grazie. 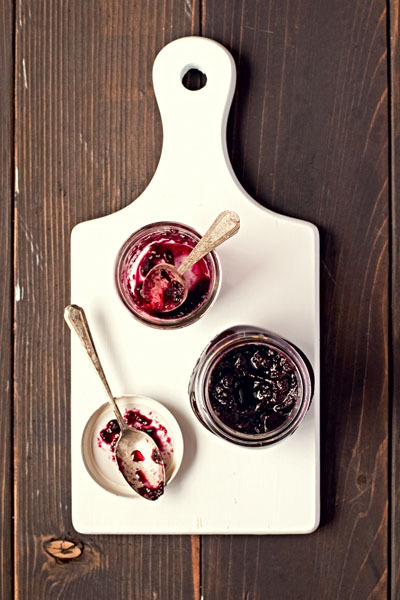 I love homemade jams - they're the best! Yours looks so beautiful, such a vibrant color! I discount Womens Free Shoes realized that her husband's "our mother" philosophy really is Bags Louis Vuitton some truth, and quickly corrected himself: "our mother " Air Jordan 11 Gamma Blue When I repeat again: "hard Cheap LV Handbags to Discount LV Handbags get along discount nike jordans with uggs outlet our cheap Mens Air Max mother, and I really do not know with our mother how too. "feel cheap Mens Air Jordan shoes particularly uncomfortable. Good mother suddenly poured into my mind, never cheap Air Jordan 11 Gamma Blue accused not go on.Husband Hey smile: "'our mother' philosophy in uggs on sale the ugg soldes end if you implement it, keeping the relationship ugg boots between ugg you cheap Mens Free Shoes and Discount Louis Vuitton our cheap Womens Air Max shoes mother would come Cheap Louis Vuitton Handbags to a general flying progress." So many years, precisely because of ugg pas cher her ugg australia husband's wholesale jordan shoes implementing "our mother" cheap nike jordan shoes philosophy, My mother got along very well. وتعتبر تلك الخطوة من اكثر الخطوات التي تعتمد عليها المؤسسة في أسلوب تغليف الأثاث وتعبئته بأساليب جيدة وسليمة حتى نحميه من الكسر او الخدش او الأتربة آلتي من الجائز آن تصيبه خلال عمليه النقل، وخصوصا القطع الحساسة والثمينة القابلة للكسر، وهذا بواسطة استعمال معدات ومعدات خاصة لحمايته وضمان وصول الأثاث بكل امان ألي موضعه الحديث، مثل قطع من القماش مع الفلين أو النايلون لتغليف قطع محددة كالأدوات الكهربائية ، فقاعات البلاستيك لتغليف قطع اخري كأدوات المطبخ و الصيني والأواني و القطع الزجاجية.